What a month September was for EQMM! We’ve been celebrating our 75th anniversary in print all year long, and we’ve still got two more special issues to go, but there’s nothing like the energy a devoted community of readers, writers, and fans can bestow in person, and we were overwhelmed by the enthusiasm of that community first at the Bouchercon World Mystery Convention in New Orleans on Friday September 16, when EQMM and AHMM writer James Lincoln Warren put together and so brilliantly moderated a panel composed of EQMM book reviewer Steve Steinbock, The Mysterious Press’s Otto Penzler (who is also a former columnist for EQMM! ), short-story writer and Ellery Queen expert Ted Hertel, Shelly Dickson Carr (granddaughter of John Dickson Carr, who was, of course, one of the genre’s most illustrious writers and also a former columnist for EQMM), and myself. The lively discussion was punctuated by glasses full of champagne (provided by our fabulous moderator!) being lifted to the magazine and its future. Just two weeks later, on September 30, many of us met again at Columbia University for a half-day EQMM symposium sponsored by the university’s Butler Library. It was an afternoon of insightful discussion, poignant recollections, a colorful and thought-provoking art presentation, a gripping reading by author Joyce Carol Oates, and much more. 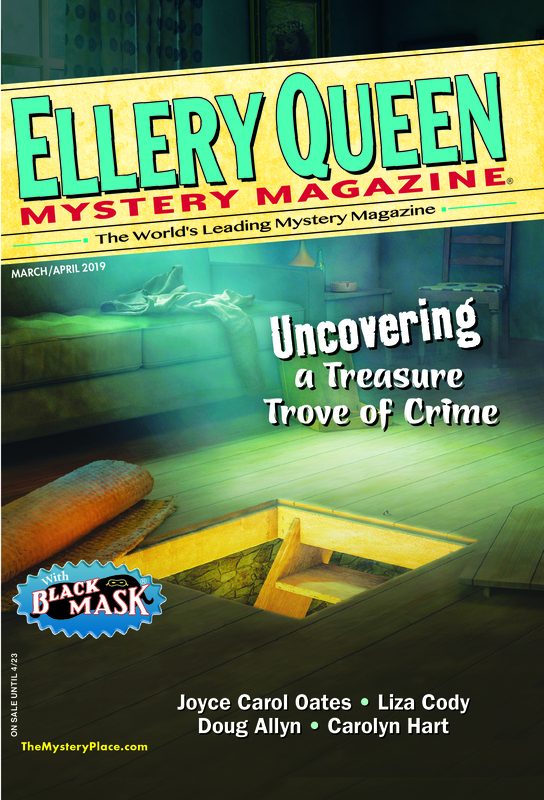 Rather than trying to summarize the afternoon myself, I’d like to direct you to two posts I’ve seen by attendees (see “Reflections on the 75th Anniversary of Ellery Queen’s Mystery Magazine” by V.S. Kemanis and “A Diamond for the Queen” by Les Blatt) and also to our podcast series, where later this week we will be posting the audio of the first panel, and our Web site, where in coming days you will find a link to the video of that portion of the program. Video and audio of subsequent portions of the program will be made available at the same locations on the Web as the editing of them is completed. And next week, we’ll be putting up a photo gallery of all of the events on this site, including the reception that followed the symposium, at which attendees were able to view the EQMM exhibition—which will continue to run through December 23. Everyone involved in these events—from our panelists and moderators and speakers to the library’s director Sean Quimby and the exhibition curator Jennifer B. Lee—has proved an inspiration to me and to the rest of EQMM’s staff. As we go forward into our 76th year, it’s with a sense of being fortunate to belong to a truly extraordinary community. Before we get to the 75th-anniversary contest solution and results, I want to insert a reminder to readers not to miss our two remaining anniversary issues: November, which has just gone on sale and highlights the magazine’s influence on crime fiction scholarship, reviewing, and criticism, and December, which includes some final thoughts about EQMM’s role in today’s publishing world. AND THE WINNERS ARE . . . Jim Noy, Twila Johnson, and Art Taylor, each of whom will receive a free one-year subscription to EQMM. Congratulations to them all! In 2011, to help celebrate the 70th anniversary of Ellery Queen’s Mystery Magazine, Arthur Vidro wrote a delightful short story titled “The Ransom of EQMM #1.” Five years later, on 8/31/16, Something is Going to Happen featured Mr. Vidro’s equally delightful follow-up, “The Mistake on the Cover of EQMM #1,” in celebration of the magazine’s 75th anniversary. This time around, the story wasn’t only a treat in its own right, but it also included an authentically Queenian “Challenge to the Reader,” which EQMM editor Janet Hutchings then turned into a contest. The solution to Mr. Vidro’s challenge has now been announced, as have the three winners of the contest’s prizes: year-long subscriptions to the world’s leading mystery magazine. Congratulations to the three eagle-eyed readers who spotted the misspelling of Anthony Abbot’s last name the fastest! What some readers of this blog may not have spotted, though, is that Vidro’s story also included more than a dozen cleverly planted Easter eggs, the little “in jokes” that software developers, filmmakers and authors sometimes hide in their programs, movies, and writings to reward those clever consumers who manage to spot them. Let’s start with the easy ones. Just before the cover reproduction that illustrates the story, we hear from Danny Nathan and Manford Lepofsky, two of Professor Harv Tudorri’s journalism students. And, when the professor offers extra credit to anyone who can name the two men who wrote together under the “Ellery Queen” pseudonym, Manford identifies “Manny Lee” and Danny interrupts him to name “his first cousin Fred Dannay.” Avid fans of the Ellery Queen series probably already know that “Manfred B. Lee” and “Frederic Dannay” were themselves assumed names: Manny Lee was originally Emanuel Benjamin Lepofsky, and Fred Dannay was originally Daniel Nathan. But that’s just the beginning! Most of the other students in Professor Tudorri’s class are named after residents of the fictional Wrightsville, the setting for a baker’s dozen of Ellery Queen’s novels and short stories, beginning with Calamity Town (1942) and, with stops along the way for The Murderer is a Fox (1945), Ten Day’s Wonder (1948), Double, Double (1950), a single chapter of The King is Dead (1952), and seven short stories and novelettes published in the ’50s and ’60s, leading all the way up to The Last Woman in His Life (1970). Emmeline Dupre, who we see chewing on a pencil in the second paragraph of Vidro’s story, is the namesake of Wrightsville’s dancing and dramatics instructor, often referred to as the “Town Crier.” The burly Jeep Jorking is a tip of the cap to a Wrightsville police officer. Al Brown, whose sleeve is stained with ice cream, shares his name with the owner of the town’s ice-cream parlor. Ed Hotchkiss, who waits to be called on, is a shout-out to Wrightsville’s cab driver, who often hung around the railroad station waiting for a fare. The original J.C. Pettigrew was the proprietor of Wrightsville’s real-estate agency. Grover Doodle, who refers to his father’s newsstand, has the same name as the son of Mark Doodle, Wrightsville’s newsstand owner. Tom Anderson, who we learn sometimes shows up half drunk for Prof. Tudorri’s class, is staggering in the footsteps of Wrightsville’s Tom Anderson, who was the town drunk—and who wound up a murder victim in Double, Double. Gabby Warum was the community’s one-toothed train-station agent. And Wrightsville’s Carter Bradford was the local prosecutor and the boyfriend of Patricia Wright. Which brings us to Milo Wiloughby, “a serious sophomore who wrote a medical column for the school newspaper.” I don’t know if this is an Easter egg within an Easter egg or just a typo on someone’s part, but “The Mistake on the Cover of EQMM #1” revolves around a spelling error—and Wrightsville’s town doctor was Milo Willoughby, with two L’s. Immediately before the illustration, the professor asks a gum-chewing girl in the front row to help him with an administrative task. Her name is Nikki Porter—and that was the name of the fictional Ellery Queen’s secretary (and sort of girlfriend). Last but not least, there’s the professor himself. Did you notice that “Harv Tudorri” is an anagram of “Arthur Vidro”?! My favorite of all Vidro’s Easter eggs is the reference to Jezreel Wright, “who was usually as silent as a statue.” In Ellery Queen’s fictional Wrightsville, you see, Jezreel Wright is identified time and again as the man who founded the community in 1701, and whose statue stands in the center of the Town Square (which is round). And that leaves Dolores Aikin, the first student mentioned in Vidro’s Part Two. Here I admit that I was stumped. It seemed unlikely that there’d be one solitary name in the story that wasn’t an Easter egg, but I couldn’t think of a Dolores Aikin anywhere in the Queen oeuvre, and even the usually helpful Google let me down. Perhaps, I pondered, this was an oblique reference to Joan Aiken, who contributed a number of short stories to EQMM in the ’60s, ’70s, and ’80s, but that seemed like an awfully big stretch. After wrestling with the puzzle for more than a day, I finally tracked down an email address for Mr. Vidro and wrote to him, begging for help . . .
. . . and then, within a minute of my hitting “Send,” a light bulb clicked on above my head and I got it: “Dolores Aikin” would be abbreviated “D. Aikin,” and, until he retired and was replaced by Anselm Newby, Chief Dakin was the head of the Wrightsville police department! I was pretty darned proud of myself for figuring this one out at last . . . until Arthur Vidro graciously responded to my email and explained that, in fact, Dolores Aikin was the librarian at the Carnegie Library on State Street in Ellery Queen’s imaginary Wrightsville. Huh. An Aikin and a Dakin, both in the same town. Who’da thunk it? If you missed any of these buried treasures in your first reading of “The Mistake on the Cover of EQMM #1,” I hope you’ll go back and read it again with Vidro’s devilishly clever Easter eggs in mind. They make what would have been a thoroughly enjoyable short story without them even more special. Ellery Queen’s Mystery Magazine was 75 years old when Arthur Vidro wrote “The Mistake on the Cover of EQMM #1.” What will he write when it is 80? When it is 85? The mind boggles. . . . This entry was posted in Books, Conventions, Ellery Queen, Fiction, Guest, History, Magazine, Writers and tagged anniversary, contest, crime, crime fiction, ellery queen, history, symposium, writers, writing. Bookmark the permalink. 2 Responses to The Champagne Toasts Have Come and Gone! Thank you Messrs. Vidro and Pachter for such wonderfully clever and imaginative pieces! Can’t say I got many Easter eggs the first time I read the story but certainly noticed I was seeing double, taking a clue to the cover mishap from the word “Newss” and all the double letters that followed in the names of Tudorri’s students and author names on the cover. (Did the duo’s double-lettering in Lee + Dannay = Ellery Queen have anything to do with their choice of character names?) This was a lot of fun and informative, as was the symposium–a fantastic event I will remember for a long time.